The F. J. Luckenbach crew in Greece, July 1945. For whatever reason, the cowboys on this ship were not allowed to take cameras on board. This is the only known picture from this trip, likely taken by an unidentified professional Greek photographer at the Acropolis. 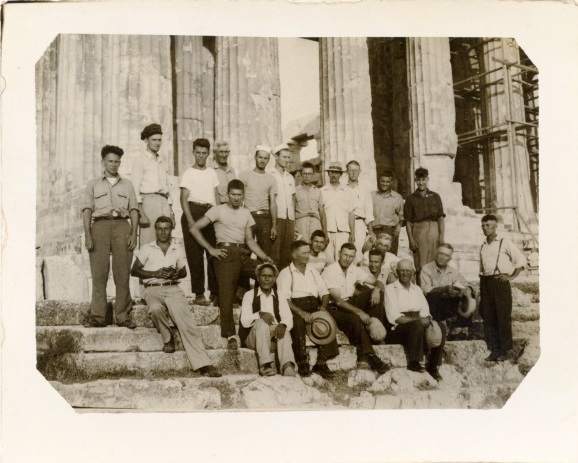 The F. J. Luckenbach crew tours the Acropolis in July 1945. Hello, Nelson. Good to hear from you again. You were one of many 16-, 17-, 18-year-olds to benefit from these trips. What an amazing opportunity that was for you all! I love hearing about, reading, and sharing your stories. Blessings to you.